Which Trusted Traveler Program Should You Choose? Should I Carry my Passport at all Times or Use the Hotel Safe? 11 Items Frequent Flyers Pack, And You Should Too! Pill Map What is it? and Why You Shouldn’t Travel Without it! Why you should visit a doctor specialized in travel medicine. Are You Prepared for an Emergency Abroad? Six Things Not To Keep In Your Wallet or Purse, Ever! Are You a Data Breach Victim? In-Room Safes- Not so Safe? 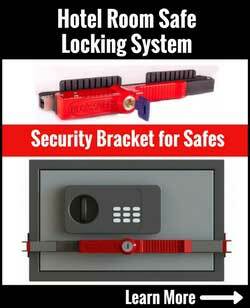 How Safe Are Hotel Room Safes? Train stations are known as “ripe picking grounds” for thieves and scammers due to the natural congestion of people. The confusion of foreign travelers in chaotic environments make it easier to rip someone off. Thieves like tourists at train stations because they are almost always guaranteed to carry more money than a local. Victims will rarely return for a trial if the perpetrators are caught. The following are a few tips to consider before you head off on your trip that involves train travel. Scammers find that ticket machines are a great location to take advantage of tourists, especially if someone is a first time visitor to the train station, as public transportation system can be difficult to get accustomed to on the first few tries. Typically scammer will look for travelers having trouble with a ticket machine. 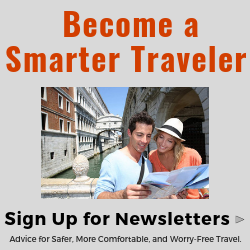 The scammers, both men and women, young and old, will offer to help the traveler out. They help you feed your money into the ticket machine, when after you place in several Euros, they press the cancel button and run off with your money. It might seem rude to refuse these seemingly friendly people just wanting to help out but sometimes, that’s the only way of avoiding the thieves. For your own safety, ask help only from the employees of the train station and don’t accept any help from random strangers. If you really can’t figure out how the ticket machine works, just go to the ticket counters. It might take a little longer, but at least you’re assured that you won’t be taken advantage of. In many European countries such as Germany, many of their country’s public transport system operates on an honor system. A traveler buys and validates a ticket at a ticket machine or ticket office which then allows them to travel in one direction for a period of time. This is where the ticket scammer comes in – they find an obvious looking tourist and try to sell them tickets that have already been validated. They offer the tickets at a lower price with some story that they too are fellow travelers and bought one by mistake, or are leaving the country and just want to get some money for it. It sounds like a good buy, but if you fall for the scam, a few mins later when you go to use it you will find out that the ticket(s) are usually expired and worthless. Furthermore, you can get into a lot of trouble if you’re caught buying from them. You are walking to your train, and may look disoriented because you have never been in the train terminal before and a scammer takes advantage of your vulnerability. An official-looking train porter approaches you and asks if he can help you find your track, train, and help carry your luggage as well seems like a dream come true when you have never been in a particular train station before. Before you say yes, you need to remember that a “fake” and “unauthorized” train porter can spot a foreigner a mile away. 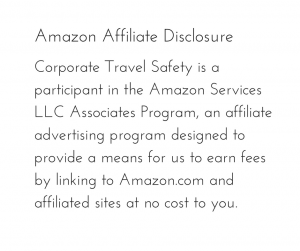 But if you don’t recognize the scam before it’s too late, you may end up being scammed out of your travel dollars. The scam is usually successful because the scammer looks like they work at the train station. These individuals usually end up costing you a lot more than an official porter, and may even try to rip off one of your bags when you are not paying attention. Another version of the fake train employee scam involves someone official looking walking up to you on a train platform and tells you that something happened to the train, or that it might even be overbooked. The scammer might even pretend to call the booking office to confirm, and might even call his/her friend that confirms this over the radio. You’re distressed because you want to keep your schedule so he’ll tell you that your only option is to go on one of the buses, which you will need to pay for. When this happens, avoid this situation like the plague. You should go straight to the train station’s official ticket desk because chances are, your seat is free and these scammers are not affiliated with the train station management in any way. Out of nowhere, a passenger gesturing wildly runs up to you and asks if a train on the next track is going to some destination. The purpose of this frantic conversation is to get the traveler (you to turn your attention away from your bags which are now behind you because you turned around to help the distraught travelers. When you are “helping the frantic traveler, an accomplice snatches your bag. It can happen as quickly as a few seconds. Strangers are approaching elderly travelers and offering to carry their heavy luggage up and down stairways and through terminals. The thief then just walks away quickly and disappears because the elderly travelers can’t keep up. So don’t travel with luggage too heavy to carry yourself and remember that even if the suitcase has wheels, they are little help on stairs. Thieves may operate at baggage locker areas. They offer the newly arrived traveler help in figuring out what coins to use in the locker and even go so far as to insert the coins, lift the visitor’s luggage into the compartment, close the door and hand the traveler his key. The problem is that they have either switched keys and handed their victim the key for an empty locker, or they’ve briefly diverted his attention and placed his luggage in one locker but closed an empty adjacent locker and handed him that key. Use caution when getting on and off train cars. One type of scam involves a group of pickpockets who work together, and will usually like to stand shoulder to shoulder at the doorway of the train or subway car. When the train or subway reaches the final destination, the doors open, by the men – who are all part of the pickpocket scan, do not move or let anyone of the people off the car. After a few seconds, the crowd on the train becomes frustrated and irate because the doors will shut momentarily. That when the crowd begins to quickly push on everyone in front of them, forcing the “blockers” away from the opening. You can now see how easy it is for the pickpocket to operate in this circumstance.The key is that other thieves are also in the crowd – maybe right behind you when all the pushing and shoving is going on. The “operating pickpockets” just blend in with crowd and pretend to be a frustrated tourist or train riders just like you. Because everyone is pushing on each other, you have no clue of your wallet be stolen, or your purse/backpack zipper being unzipped and valuables by this “innocent person” behind you. This is where a security purse or security backpack with locking zippers, or security money wallet comes in as a great pickpocket prevention tool. Always double check to see that your bags are indeed in the locker where you think they were placed and also be sure to check to see that your key and locker numbers match.Most thefts on trains occur at the station during the few minutes passengers are getting on and off. That’s when travelers pay the least attention to their baggage because they are either busy saying goodbye or looking for luggage carts. Many travelers also leave their bags unattended near the door while they search for a seat, making it easy for a thief to grab a bag and get off the train just before the doors close and the train pulls out of the station. If you plan to ride Europe’s rails, you might want to take along a small chain and lock to ensure that you and your suitcase don’t become separated. Chaining your suitcase to the train’s luggage rack is an idea suggested by many Italian railroad policeman. Another scam may involve you waiting at the train platform for the next train. If you have very large bags and have to leave them on the luggage racks provided on some trains at the end of each car, you may want to rig up a small chain and lock to secure them to the rack. It’s also not a bad idea to do the same if you’ve placed your luggage in the overhead rack above your seat. Smaller bags, such as attached cases and pocketbooks, usually are the prime targets of thieves, because they are more likely to contain money, cameras, and other valuables than are larger suitcases. Don’t leave them unguarded. Take them with you when visiting the dining or bar car. At night, never put clothes containing your wallet or handbag on the overhead rack and go to sleep. 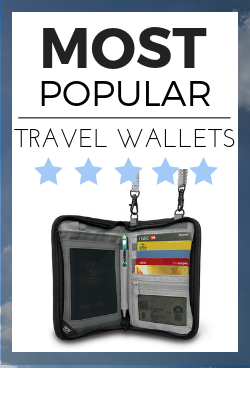 Keep your valuables in a money belt or safety pouch on your person. Don’t accept offers of food or drink from strangers on buses or trains. These items may contain knock-out drugs. While the victims are unconscious, they are robbed of all their belongings. Be wary of so-called railroad or train assistants. Many times they may even look like they work for the train, but unless you know how to tell them apart, these scammers are downright great actors and actresses. They look and sound official and will walk right up as you are trying to carry your luggage onto the train.These scammers make it a point to act very friendly and helpful and almost overwhelm you with kindness in an attempt to help you with your luggage and show you to your seat on the train. You’re very grateful for the kindness this attendant has shown you, but once you’re seated and settled; the man or woman will ask you for a mandatory tip, but once you’ve been shown to your seat, you feel embarrassed, and you give the person a tip.If you have difficulty in a train, approach the customer service desk or the cashier instead, so you won’t fall into the trap these fake attendants that are usually very successful in taking advantage of unsuspecting tourists. Take a little bit of time before you board a train and find out what real train attendants look like. This is one suggestion that every traveler should know about before they board a train or bus overseas – make sure your ticket is endorsed. In most European countries, the transportation is based on the “honor system” and your tickets are checked once you are on the train or bus. Make sure that before you board, you get the ticket “endorsed” before you get on the train or bus using the machine when you get on. If you don’t you could end up getting stopped by the local police and given a fine – sometimes being a lot of money. Depending on the country, train or bus station you use to board the train or bus, typically you will find some type of ticket machine close by near the boarding location that you would use to “validate” the train or bus ticket. You will find this all over Europe, but know that that the language / sign on the machine used to do this will be different – depending on the language spoken. For instance, in France, the signs above the machine or kiosk may say “composte” or “composting.” If you don’t do this, and you get stopped by the local police, or train/bus staff checking your tickets, they may make you get off the train/bus so you can “validate” your ticket. The problem with this is that you will then have to wait for the next train or bus, which could be a big problem, depending on your schedule.